LOS ANGELES (GaeaTimes.com)- The last episode of “Oprah’s Ultimate Favorite Things Show” focused more on the materialistic possession of the ace talk show host. She gave away more than twenty items that are close to her heart. However, on yesterday’s episode she paid an ode to those people who have made some contribution to the society and the life of other people. 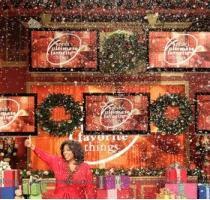 In the “Oprah’s Ultimate Favorite Things” show yesterday, more than 300 people came to the studio, to get a share of the excitements and fun that was awaiting them in the studio. One of the several people, who was invited to the studio was, James Turkson and Jennifer Turkson. James Turkson is a University of Central Florida researcher. Born and brought up in a poor family of Ghana, he could not do much, when his mother expired due to cancer. Since then, he has been striving to find a cure for cancer through his research. In the show, they not only received a seven-night Caribbean cruise, but they were also called down to share a personal moment with Oprah Winfrey. The other person who was given a tribute in the show was Connie McCahan of Winter Springs, who is part of a three year old organization called “Change Through Giving”. Every month the organization does something different for charity. They either send care packages to troops or go to Harbor House for a pizza party. Sherri Franklin, the owner of Muttville, rescues dogs and prepare them for adoption. This organization wrote to Oprah Winfrey as they were in search of local heroes. The talk show host was so impressed with their endeavor, that she invited them and surprised them with an iPad. She has also revealed, that 2012 re-designed VW Beetle, which they received, will be painted with the Muttville logo. Some of the other gifts distributed to the audiences were clothing, gift certificate and kitchenware and diamond earrings amongst others. No audience went back without a gift in the “Oprah’s Ultimate Favorite Things Show”.